A Huge thank you to all our supporters, we couldn’t run SOUP parties without you! 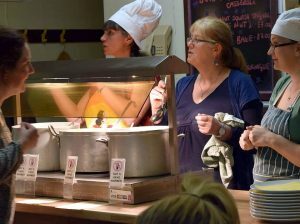 We have wonderful local businesses supporting us by donating soups so that we can keep our soup fans well fed. We always have a vegetarian, vegan, gluten free and dairy free options. and to ALDI for agreeing to donate ingredients for our home-made soups at EVERY SOUP party! A huge thanks and shout out to ARVON ALES and Steve Horwood from LOVE SOUND LTD who donated cash to swell our prize funds. And finally…..thanks to Trawsnewid Llandrindod Transition who funded the prize for our recent on-line sustainable SOUP competition. Phew! What a community! We really are lucky lot to be surround by such generosity! We love what we do so much that we created a little book all about Llandrindod SOUP. It’s got lovely soup recipes from our SOUP team and the groups and people that won SOUP funding last year. For just £3 a copy could be yours - simply drop us an e mail or buy one at the next SOUP event.